The Fastest Hands In The East Meet The Biggest Mouth In The West. One's all talk ... the other's all action ... Jackie Chan and Chris Tucker mix punches with punchlines in this hilarious action-comedy. Chan is a tough Hong Kong cop in Lops Angeles to solve the kidnapping of a Chinese diplomats' daughter. But the FBI wants none of his help and recruits a fast-talking LAPD detective (Tucker) to babysit him. Cultures clash and tempers flare as these two cops from different worlds quickly discover one thing in common: they can't stand each other. With time running out, they must join forces to catch the criminals - if they don't kill each other first! $33.001 million on 2638 screens. Let's see here... We have Jackie Chan, who's kind of a poor man's Bruce Lee. He's teamed up with Chris Tucker, essentially the poor man's Eddie Murphy. What's the end result of this? Rush Hour, a movie aptly referred to as the poor man's 48 Hours. All this "poor man's this" and "poor man's that" may not seem fair, but I really think it fits. Rush Hour amounts to a sporadically entertaining but largely trite film. 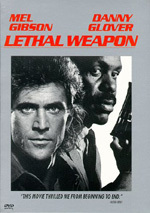 It's yet another in the successful "mismatched buddies" genre used in movies such as Lethal Weapon and the aforementioned 48 Hours. We've seen it all before, and we've seen it done better. The story to Rush Hour offers virtually nothing new. It's just a couple guys who initially don't like each other but they earn each other's respect and admiration as they overcome the odds to halt a threat. Geez, how many thousands of films could that describe? Although the pairing of an African-American and an Asian is unique - we usually get the white guy and the black guy - there's little else here that makes the movie stand out from the crowd. That wouldn't be a problem if the film was better executed. As it stands now, it's a competently made but entirely mediocre piece of work. The jokes are amusing but not terribly funny, and the action adds a little spark, but there's nothing extraordinary. Director Brett Ratner keeps the film moving at a fairly leisurely pace; he really does nothing that either adds to or detracts from the experience. Mainly, the film seems to count on the magnetism of its two stars to interest the audience, and that certainly appeared to work, based on the big box office the movie did. Unfortunately, I can't say that either lead did a lot for me. I've never really understood the vast global appeal that Chan possesses. Certainly he does some nicely acrobatic fight scenes, and his willingness to risk his hide for his work certainly creates some interest, but he just seems to try too hard to be the audience's buddy. He always has this kind of goofy, sappy aura about him that simply makes it hard for me to take him seriously. I don't think he's a bad actor, and he certainly doesn't harm this film in any way, but his performance largely leaves me flat. Chris Tucker is a different case. He's become one of those "love him or hate him" performers. I actually like him. Though I certainly understand why his shtick grates on so many people, I think he creates a presence that may not be unique but that certainly sets him apart from other actors. I may be the only person on the planet who feels this way, but I thought his beyond over the top turn in The Fifth Element was the best thing about that film. To stand out as freaky in a rather bizarre film was nothing short of amazing, and his performance consistently entertains me. In Rush Hour, however, Tucker falls back on his Eddie Murphy influences way too much. His opening scene is a complete rip-off of the beginning of Beverly Hills Cop, and much of his work looks like outtakes from that film. Basically, Tucker's James Carter is nothing more than a manic version of Axel Foley, and a much less funny one at that. 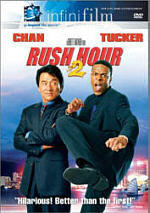 Tucker certainly possesses some talent, but Rush Hour does a good job of hiding that fact. At only 98 minutes, Rush Hour never overstays its welcome, and its breezy tone makes it a decent piece of entertainment. It just never rises above that level. We find a watchable, sporadically amusing effort that doesn’t turn into anything memorable. 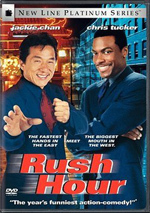 Rush Hour appears in an aspect ratio of approximately 2.35:1 on this single-sided, double-layered DVD; the image has been enhanced for 16X9 televisions. This 1999 transfer showed its age but usually looked respectable. A few concerns affected sharpness. I noticed mild edge haloes throughout the flick, and wide shots occasionally seemed somewhat tentative and soft. Most of the movie exhibited pretty positive definition, though I thought backgrounds could become a bit blocky. Jagged edges and shimmering created moderate distractions, but the flick lacked any source flaws. Rush Hour went with a lively palette, and the colors mostly appeared positive. A few shots seemed a little smeared, but the tones usually came across as nicely vivid and dynamic. Blacks were slightly inky, though, and shadows could be somewhat murky. The positives were strong enough to result in a “B-“ image, but the flick did come across as less than stellar. Most of the time, the Dolby Digital 5.1 soundtrack seemed quite good. In fact, only inconsistent ambition to the mix’s soundscape left it below “A” level. Not that the soundfield failed to involve the viewer. Music showed very nice stereo imaging, and the effects created a good sense of place. The action sequences opened matters up quite well to form a solid impression. However, these scenes didn’t fill a ton of the movie, so I didn’t think this was a track that could enter “A” territory. Audio quality satisfied. Speech seemed natural and concise, and I noticed no edginess or other problems. Music was bright and dynamic, while effects appeared solid. Those elements came across as clear and clean, and the whole package boasted nice bass response. I liked a lot about the track and felt it was more than satisfactory. As we head to the extras, we begin with an audio commentary from director Brett Ratner. He provides a running, screen-specific chat. Ratner tells us how he came onto the project and how he convinced Jackie Chan to appear in the flick. The director also discusses cast and performances, sets and locations, stunts and action choreography, story and pacing, music, framing and camerawork, and other production elements. An eager participant, Ratner gives us a nice look at his film. He proves enthusiastic and informative through the commentary. Ratner offers good details about the flick and does so in a rich, involving manner. This means nice insight into the mind of a then-young director, though I do wonder whatever happened to his desired remake of The Killing of a Chinese Bookie. Another commentary track is available as well. Composer Lalo Schifirin speaks a little about his work during the isolated score. Obviously, this commentary isn't as extensive as the one from Ratner; Schifirin only talks when the music isn't playing, which makes sense. Anyway, it's an interesting look at the thoughts and decision-making of a veteran film composer. The Rush Hour DVD includes many video supplements. Foremost is the 40-minute and 48-second behind the scenes program called A Piece of the Action. We get notes from Ratner, producer Roger Birnbaum, stunt coordinator Terry Leonard, and actors Chris Tucker, Jackie Chan, and Elizabeth Pena. The program covers casting and convincing Chan to come onboard, working with the actors and Ratner’s style on the set, stunts and shooting the action scenes, and other production elements. I found this program to be somewhat disappointing. It's basically a disjointed amalgam of interviews and raw footage from the set. It provides some interesting glimpses of the proceedings but it didn't add much to my enjoyment of the film, although it was interesting to see how much work went into choreographing and shooting the action scenes. One very nice extra is Whatever Happened to Mason Reese?, Ratner’s 11-minute and nine-second student film. He mentions this movie during the audio commentary, and it's fun to actually see it. It's not a great piece of work, though it's interesting in a strange way. As an archival piece, its inclusion is greatly appreciated. I also really enjoyed the fact that two of Ratner's music videos appear on this DVD. We get Dru Hill's “How Deep Is Your Love” from the Rush Hour soundtrack, and Heavy D's Nuttin' But Love, the latter notable mainly because it features Tucker. Neither is great, but they're interesting, and nice to have. Also, both these videos and Whatever Happened to Mason Reese? include additional commentaries from Ratner. As usual, he proves chatty and informative. His track for Reese is especially interesting. Six Deleted Scenes run a total of two minutes, 56 seconds. With such short snippets, you shouldn’t expect much from these. We get some minor additions such as Soo Yung’s first day of school and more obstinate behavior from the feds but not much that stands out as memorable. A clip in which Carter bluffs his way into the film’s ending reception is okay, though. 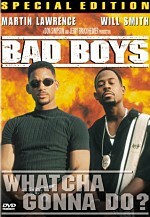 The DVD also contains the theatrical trailer as well as cast and crew bios. We find listings for actors Chris Tucker, Jackie Chan, Tom Wilkinson, Julia Hsu, Elizabeth Pena, and Tzi Ma plus director Ratner, producers Jonathan Glickman, Roger Birnbaum and Arthur Sarkissian, screenwriters Ross LaManna and Jim Kouf, director of photography Adam Greenberg, editor Mark Helfrich, production designer Robb Wilson King, costume designer Sharen Davis and composer Lalo Schifrin. I usually refer to these as the "standard cast and crew bios," but I can't do that here because whoever wrote them put a lot more effort and care into them than is typical. The information provided in these tells us a lot more about the participants than is usual. Rush Hour offers minor pleasures. The movie has some fun moments but doesn’t quite hold up overall. The DVD presents acceptable picture with very good picture and extras. This is a pretty nice release for an erratic film.